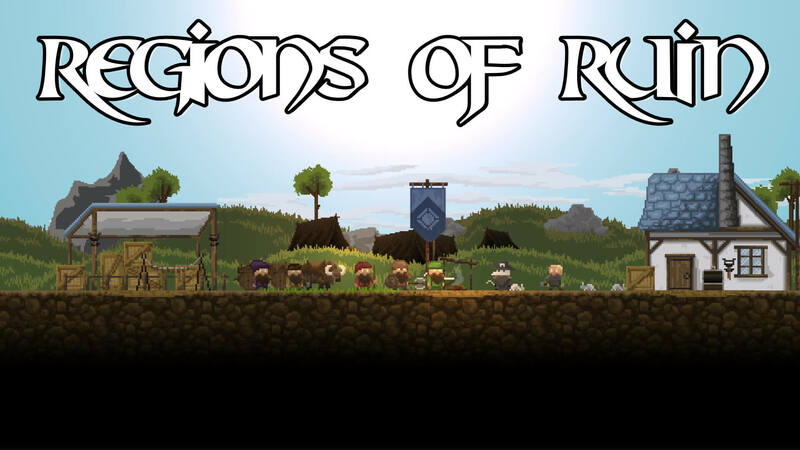 Regions of Ruin is a charming and fun game, a welcome surprise of the indie variety developed by Vox Games and published by Poysky Productions. NOTE: The game is still in EARLY ACCESS and this is not a full, final review! Now, I keep using one specific phrase: “I got mad love for indie titles.” And I do. Which does not mean that I will accept just about anything and embrace it, just because it is indie. I will like and support the titles that are fun and have interesting gameplay, regardless if they come from a tripple A studio or a fella working out from his momma’s basement. It is the quality that sells to me, not the size of the marketing budget. Regions of Ruin hits this right on the spot. It is most charming and fun game I’ve played in a while. Even though I am quite ambivalent when it comes to graphics in a game – I will appreciate gorgeous vistas and scenery, but also play a game like Panzer Corps – the “pixel” type of indie games can be very amusing. Graphic is not the alpha and omega – gameplay is! Regions of Ruin presents a world where dwarves have been exiled from their underground cities after a long, destructive war, and are only now trying to reassert themselves in the old world. You, as the leader of a future settlement, are in charge of its development and resource gathering. You start out with a literally only a place in the clearing to set your camp fire on; by moving along you begin your own, long quest towards establishing your settlement. You lead a dwarf in a side scrolling adventure and fights with numerous wicked species, from goblins to orcs and trolls. You control the character by WASD along with jumping and dashing. Game reminded me for some reason of an old hit called Ghouls and Goblins. Smash your foes with a sword or an axe, defend with your shield and hurl axes at targets in distance. A very basic, yet fun RPG skill system enables you to invest points as you level, unlocking major and minor traits. Some will enable you to hit stronger with your sword, others will stun enemies, increases defensive rating of your shield of the damage your throwing axes do. It is also fun and straightforward. The goal is to explore world on the big map, discover places of interest and clear them up with your character. On these locations many interesting things happen. For example, you will encounter a local farmer who will point you to a camp of goblins. When you smash all the goblins, you can take their resources and use them for your own purposes. If you come across imprisoned dwarves, you can set them free and will have them as laborers later on. When a specific point/place on the map has been cleared, you can send your workers to extract resource from that specific place. In other words, clear out an orchard from enemies, receive some resources as a reward and finally send your workers – the more, the faster will the gathering proceed – to supply you with more food. Next to the food there are other resources such as wood, stone, coal, iron and so on, each of these being needed for specific buildings and their upgrades. Very soon you will have your own blacksmith, tavern, storage depot, medical facilities, trade market and many more buildings, all fulfilling different roles and helping you in your quest. You can also hire mercenaries to follow you on your trips, but you won’t have a permanent party along with you, which I find a bit sad. This is it; the gist of the game. And despite rough pixelated graphics, chances are that you are going to emerge yourself into this world pretty quickly. I found myself blazing through the first couple of hours of gameplay without noticing the time. There were three states of mind for me in regards of this game. I had fun. I thought that the game is charming and gameplay simple and entertaining. And, more important than anything else, I found myself very relaxed and unwound after playing the game. Perhaps that is the reason why I feel so positive about this game. Finally, when asked for conclusion, I need to tell the following first; this is an indie, pixel game and must be rated as such. It can’t be compared with tripple A titles or the hits of the year. I find entertainment in watching a good series at home, a movie blockbuster in a cinema and watching a circus show, but I can’t really compare them on the same level. Apples and oranges, you know? That being said, Regions of Ruin is a very good game, one that you do not talk much about but simply have fun playing. I recommend you try it out, but first watch the Let’s Play video to see if it is something that will strike your fancy. Once again, be advised that the game is still in EARLY ACCESS phase and that it is going to see more changes in the future. This is one of most charming and fun game I've played in a while. While still being in early access, it offers at least some 10+ hours of gameplay and is already quite fun! I am looking forward to see what new additions will be introduced by the time the game comes out.